Considering the weekend containing Krampusnacht, we focused on the famous legendary "Christmas Devil," Krampus. Henry, read some information on the classic character's legend, after which it became known that somehow the show was not broadcasting Kat, Ceiling Cat Barbara Duncan or myself, the chat room could only hear Henry. Henry tried calling us back in while on the air, to see if he could get us audible to the chat room, but it didn't work. Earlier, Henry accidentally let his computer "upgrade" to the dreaded Windows 10, which we began joking may have been the problem. CC suggested we stop the show, and have Henry start his still-Windows 7 laptop, and go through that. Sarge produced the show, bringing us all in, though CC's system wouldn't let her. That or Skype wouldn't let her audio come through, despite trying. Kat and I (and the chat room), really wanted Henry to save the first part of the show, so they could hear Kat and my quips during Henry's near-comical frustration. When we came back, Henry implied he didn't save it; Kat and I hope/d he could recover it. Kat read an article about Perchtenläufe: Salzburg's Pagan Heritage. She also indicating having found a cool Krampus Holiday Tree Ornament she'll be putting on her tree. She also found the strange http://simnet.is/gardarj/yule11.htm Santa Centaur ornament. Late Thursday night I saw the new Michael Dougherty horror comedy movie feature film, so I imparted my views on it. 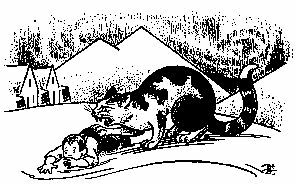 Kat brought up the Iceland Yule Cat, about which Marla Brooks and I discussed on her show when I was a guest December 2011 and December 2012. In the Skype chat, CC was able to convey out having listeners tonight in the US, UK, Canada and Australia. We touched on the movie TrollHunter, what with its style similar to the "Christmas" movie Rare Exports: A Christmas Tale, based on the online video shorts. Kat read a National Geographic article on How "Krampus, the Christmas Devil" Became Cool. 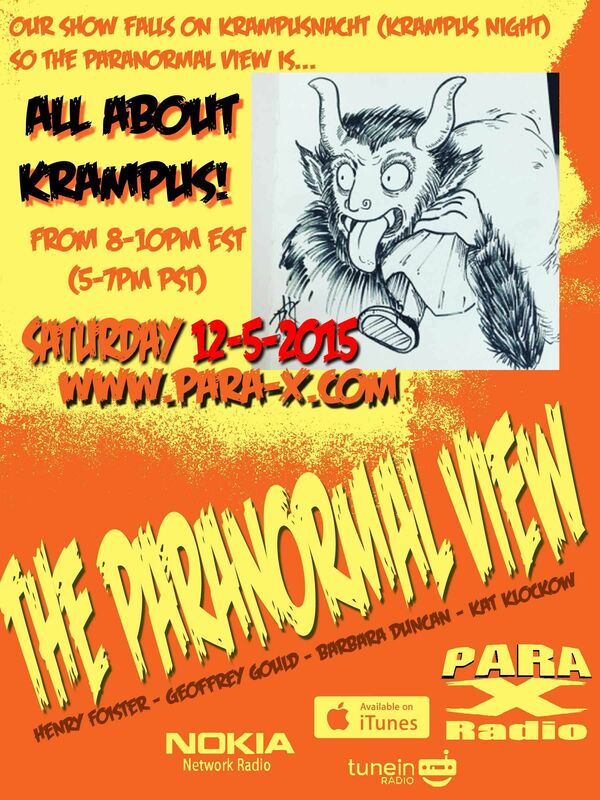 She also pointed out that Jeff Belanger posted wearing a Krampus Ugly Sweater. I provided my Paranormal View hub page on my website, indicating people from there can find the show's respective report pages, and that we're very findable on Facebook, the official Paranormal View page page, and invited everyone to Follow Me on Twitter at @realbadger. Unfortunately, while Henry recorded the first segment, it was unclear as to whether he properly saved it, as he hastily tried to fix the issue/s at hand. He claimed the file implied being recoverable, but the uploaded podcast does not have it, so the chat room only heard the one-sided conversation, but not the hilarity going on between Kat, CC, and myself; comedy "gold" as Kat correctly put it.